Tencent, which owns a majority stake in Riot and a minority stake in Epic, has been attacked, with their Beijing office having been vandalized earlier today. Chinese media immediately jumped onto the story and posted images of the incident. The vandal splashed paint on Tencent Beijing's glass doors and sprayed the word "shameless" on the glass. According to a Kotaku friend who works at Tencent, the damage wasn't actually done to the office doors themselves, but rather to Tencent's on campus coffee shop. Tencent's Beijing campus is located on a main road, and pedestrians are free to enter most of the grounds and the coffee shop. According to both NetEase and Sina news, the vandals were upset with a few members of Tencent's PR and marketing department and one member of Tencent's service department. Reports say that the aforementioned people aren't with the company anymore. Weibo users nearby posted images of an alleged poster found on trees and power lines near Tencent. 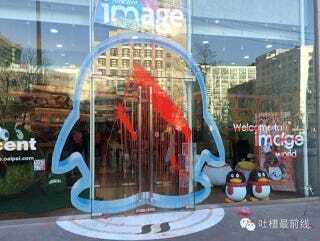 The posters have the faces of the former Tencent employees and why the office was vandalised, saying that the former employees were behind an incident that involved hurting a 70 year-old woman. To put this all into context as one Kotaku reader put it, think of someone vandalising a coffee shop inside Google HQ, except the company is Tencent and it's also one of the biggest video game publishers in the world. Tencent is one of China's largest internet companies, with fingers in multiple industries. Headquartered in Shenzhen, Guangdong province, the company is China's largest video game developer and publisher.